This e-learning supports the Person-Centred Approaches Framework, which was developed by Skills for Health, Skills for Care and NHS Health Education England. Both the Framework and this eLearning were created with input from people with experience of using health and social care services. The scope of this eLearning is to introduce the behaviours, knowledge and skills for person-centred approaches, including the values, core communication and relationship building skills, engaging people and enabling and supporting people. The course includes a Learning Journal for you to document your thoughts and reflections on the person-centred approaches covered in the course. It can also be used to plan how you take your learning forward and put it into practice in your role. This eLearning is aimed at people working with people, families or communities in different services in the public, private and not for profit sectors. If you already have an account with e-LfH, then you can enrol on to the Person-Centred Approaches programme by logging in to the e-LfH Hub, selecting My Account > Enrolment and selecting the programme. You can then access the programme immediately in the My e-Learning section. 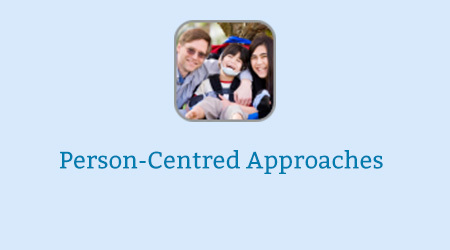 The Person-Centred Approaches programme is also available to NHS healthcare staff via the Electronic Staff Record (ESR). Accessing this e-Learning via ESR means that your completions will transfer with you throughout your NHS career.